Question from Alex: What’s the difference between the grapes we eat and the grapes that make wine? Can you eat wine grapes? Reply: Hi, Alex. Thanks for writing! As your question implies, wine grapes aren’t the same as the ones we buy at the grocery store. But, you can certainly eat wine grapes. If you visit a wine-growing region during harvest tasting the grapes is a must – they’re very sweet and delicious. The grapes we purchase at the produce counter are usually between 15 and 20% sugar. Grapes for wine (except sparkling wine) are harvested at between 20 and 30% sugar, most often between 21 and 28% – very, very sweet! All grapes fall into the genus “Vitis”. Most of our favorite table grapes, like Flame Seedless or Concord, the species is lubrusca. So, they’re classified as Vitis lubrusca. If you like Muscadine grapes or wine, or Scuppernong, they’re categorized as Vitis rotundifolia. You can make wine from table grapes – Concord wines are out there – but we, as consumers, just don’t seem to like them very much. We seem to have a taste for wine that’s made from Vitis vinifera – wine grapes in every day parlance. So, now you know why the names of the wines are so hard to pronounce. The most popular varieties traveled to other parts of the world from France, Italy, Germany and Spain. 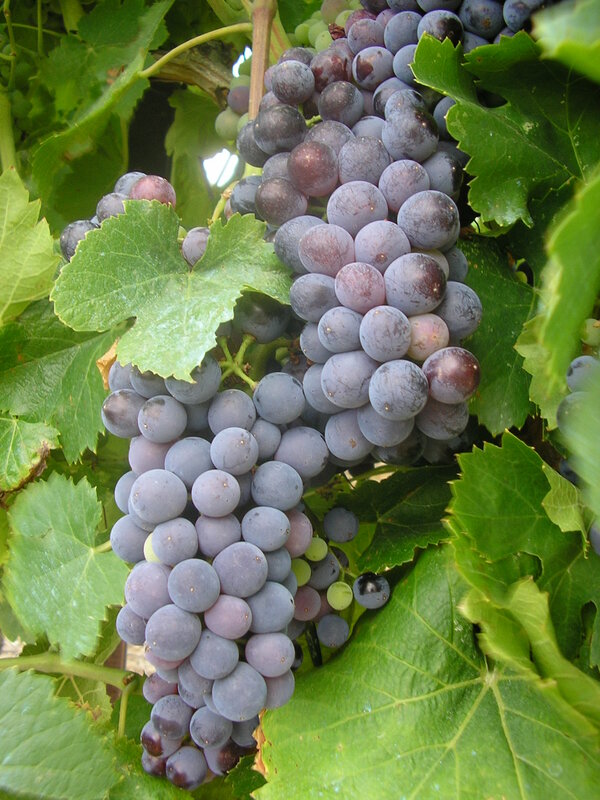 Historians tell us that Vitis vinifera is native to the area south of the Black Sea, in what is now Georgia and Armenia, and traveled west from there. Of course, Europe takes the credit for making these varieties famous. They’ve found wine residues in ancient amphorae going back to 7th century, BC, so this is one very ancient beverage. Since wine makes itself, you can assume wine it’s as old as man and grapes. You’ve probably noticed that in America and other new-world regions we name our wines for the grape, such as Chardonnay or Malbec. Traditionally, most European wines are named for the region and there are local regulations regarding what variety can be used for commercial production in the region. With the emphasis on location and regional character the Europeans are the ones responsible for the notion that the more specific the appellation (identifies where the grapes were grown) the more distinctive the wine. Increasingly, moderately-priced European wines have begun to include the varietal name on the label in order to compete in the vast new-world market – especially those of the Languedoc region (Vins de Pays d’Oc) in southern France. Regardless of the name or variety, the vines are propagated by cutting and in most of the world, Vitis vinifera is not grown on its own roots due to lack of resistance to certain soil pests, phylloxera in particular. The first harvest is usually three to five years after planting and the economic life of the vine is often 30-40 years (this is extremely variable). TRIVIA: Worldwide, most European varieties are grafted onto phylloxera-resistant American rootstock – even in Europe!